of nature writing, Vernon RL Head. 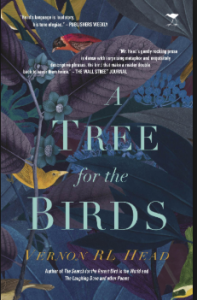 In 2014, Vernon took the bookselling world by surprise with his hit, The Search for the Rarest Bird in the World, a book which sold out from most stores in the month before Christmas, leaving prospective book buyers literally searching for The Search. This time around we venture deep into the mysterious world of the Congo River, the Great Dancing Road. We meet Chrisnelt, a young Congolese boy who grows into manhood shaped by the vast leaves held in the branches of tropical forests, all the while battling a ravaged world of globalized greed and death. Chrisnelt is a gardener of unusual genius: he learns from birds, insects, and foreign weeds; and he counts raindrops falling from clouds, finding exquisite numbers that sing of the interconnection of peoples everywhere. Chrisnelt is guided by the ancient journey of water in his part of Africa: the constant flow to the ocean, and the rise back into the sky of mists mentored by the deepest river on Earth. Vernon RL Head offers a novel of profound beauty. Set in the heart of Africa, this powerful story at the edge of damnation bends a reflection of all of us through the eyes of a birdwatcher who sees wings fly like escaping leaves on streams of eternal water and air for all.